With every material object, there will come a time when your baseball glove will in fact fall apart. But, no need to worry, you have options. You can take your glove into a store or an individual who can re-lace your glove for you. But to save some money and perhaps enjoy a little side project too, you can do it yourself for minimal cost. This article is a guide for lacing baseball gloves on your own. It will include the step by step process along with everything you need in order to get your glove good as new. These listed tools below will help you along the way in re-lacing your glove. Make sure to give yourself plenty of time to re-lace your glove, don't rush. You'll be thankful you were patient in the long run. Laces (see details page in Amazon): For most gloves (with the exception of a catcher's or first baseman's mitt), 3/16" wide laces and 72" long laces are recommended. For catcher's mitts along with first baseman's mitts, 1/4" wide laces necessary. Baseball Glove Needle (see details page in Amazon): Similar to a sowing needle, the tip of the needle has an "eye" where the leather goes right through. Wire Cutter (see details page in Amazon): To cut the excess lace at the end of of the hole. Conditioner (see details page in Amazon): Used once the laces are taken out, and then again afterwards to refresh it. You also want to put it on the laces before you insert them into the holes, it will help it slide right in. For first timers, it’s highly recommended to take the glove apart piece by piece (the palm, the web etc. ), opposed to taking it apart all at once. This is so you don’t get lost, and will be able to easily remember where each lace goes. Since each glove has slightly different lacing patterns, take pictures or perhaps even a video of the current lacing of the glove, so you’ll have a fresh image of where each lace needs to be. If it’s still too complex, make a diagram like this one. Insert the needle through the hole, make sure to take it one lace at a time. User the needle to punch your way through the glove, removing the old lace. Once you have removed the old lace, replace it right away with a new one. Apply conditioner onto the glove once all of the old laces are removed. Apply a generous amount on, making sure you work the conditioner into spots you normally wouldn’t be able to reach (e.g. between the finger stalls.) Apply it even on the inside of the glove as well. The palm is the most difficult part of the glove to re-lace is the palm. This is because the palm has both the pinky and the thumb slots, which we must be cautious of when we re-lace. We need to make sure that we avoid the pinky and thumb stalls and lace around the slots and not in them. Otherwise your fingers will hit the lace each time you put your hand in the glove. Take one piece of the new leather, tying a single knot around the lace like this. Starting with the hole on the pinky on the backside, insert the needle through the hole and glide it through the top hole by the pinky. The first hole looks like it doesn’t belong. Now, begin tracing the line down the palm of the glove. Using this image as a guide, go hole by hole, in and out, making sure you weave it through the top hole, (not seen in this image.) Also keep in mind that your laces should be smooth side up (pointing to you), it’ll really pay dividends in the long run. Make sure you thread the leather through each top row and going through each available hole. The pattern for the palm should be lace, lace, lace, space, lace, lace, lace. Avoid lacing baseball gloves over the pinky hole, otherwise you’ll have to go back and do it again. Use your thumb to hold up the pinky loop like this, and make sure you lace under it. Once you reach the webbing area, use the closest hole to tie off a knot. The heel won’t need any knotting like the palm does. You can start at either end, the pinky or thumb. Either way, you want to start with your needle entering in from right to left. Begin by making a loop in the first hole. The needle should enter in the first available hole. There will be some excess lace left over. With this lace, you have multiple options. With most Wilson gloves, the lace will go down roughly three holes, not counting the first hole which you started in. Most Rawlings and Mizuno gloves go down two spaces. Using your non-lacing hand, keep your thumb on the lace over the two or three holes. You then want to re-enter the first hole, making a loop around it. The loop will form itself once you thread the needle through the top hole. Make it as tight as you want, but remember the tighter it is the less flexible your glove will be. Go into the second hole, repeating the process above. Keep the excess lace tucked in under the knot. Once you finish the outer shell of the heel, insert the needle through the next available hole. Once again, don’t make it too tight, otherwise you’ll have trouble closing the glove with your thumb. Complete this process until you finish the last hole on the heel. When you finish the last hole, you’re going to want to make the same loop that you made with the first hole on the heel. Insert the needle through these first two or three holes, however many your glove permits, and pull through the loop so it makes a nice straight lace. You can now cut the excess lace. Different types of webbings will make each web re-lacing slightly different. I’ll be using an example for an I-web. Starting in the top left or right hole, thread the needle through the hole. Leave roughly four inches of excess lace for a knot. Now we need to attach the web to the glove. To do this we’ll simply pull the lace through the bottom top hole. Once we have gone through the top bottom hole, we need to go back around. We’ll insert the needle through the very top part of the web. As seen in the second image below. Leave a little bit of space betwen the webbing and the glove. 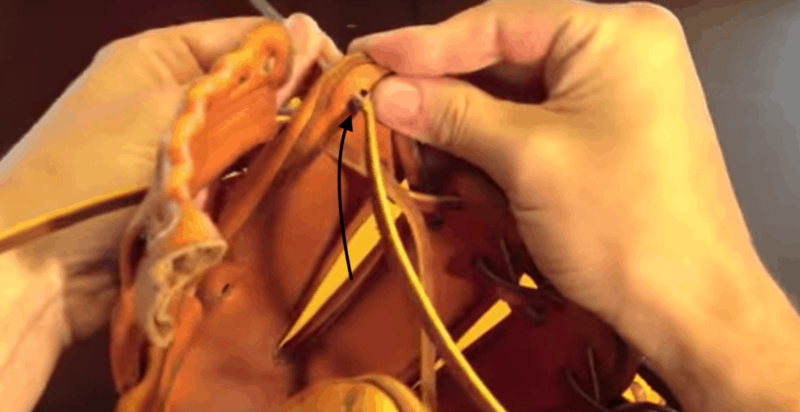 Connect the webbing to the otherside of the glove. Insert the needle through the top hole on the right. Pull through so that the top part of the web is now connected to both sides of the glove. Once you pull through, you’ll now be on the other side of the glove. Making sure the smooth part of the lace is still up, insert the needle through the next hole, right below the hole you just came out of. Feed it through there and you’ll come out on the other side. Now insert it through this hole. Now using the lace we had left over from the beginning, make a knot using the two excess laces. It should look something like this. Make sure the smooth part of each lace is facing away from each other. Now repeat this process for the bottom half of the web. Notice the web spirals in this picture. See how they’re pointing to the left? This indicates that we must start on the left side or thumb side for right handers. Get your piece of leather that you’re going to use and snip the end, creating a better angle for the leather to go through the holes. Make sure you’re using an adequate length of lace. Tie another knot at the end of lace, then start on the first hole in whichever direction the spirals point. Once the knot is tied and the first hole is completed, it should look like this. Entering hole #2, repeat step one, minus the knot. Pay close attention to the location of hole #2. Thread the needle through the hole, it’ll come out the bottom part of the hole on the other side. Tighten it as tight as you wish. Back to the pinky for the next hole, thread the needle through once again. As seen below, it’s on the bottom hole. For hole #4, repeat the same process, and insert the needle through the top row on the ring finger. As seen in the image, you can go either under the cross lace or over. It’s personal preference and won’t make a difference either way. Repeat these steps, in the same order. Once you finish the fingers, it’s now time for the spirals. Tighten the lace as tight or as loose as you wish. Come out through the same hole you just went in. This will create a nice loop. Don’t make it too tight otherwise your glove structure may deform. Going into hole #2, use the same process as seen above. Repeat these steps till you reach the last hole. Once you do, go through the last hole twice. Loop it around the remaining space on the tunnel. Next you want to take the needle and come through between the webbing and come out right next to it. This is the needle coming out on the opposite end. Once the needle has gone through the opposite end, insert it through the top hole on the thumb. Since most gloves don’t have the hole where the needle is seen through in the picture you’ll want to put your needle through this hole. Once you have gone through the hole which pertains to you, make another knot and cut the excess lace off. 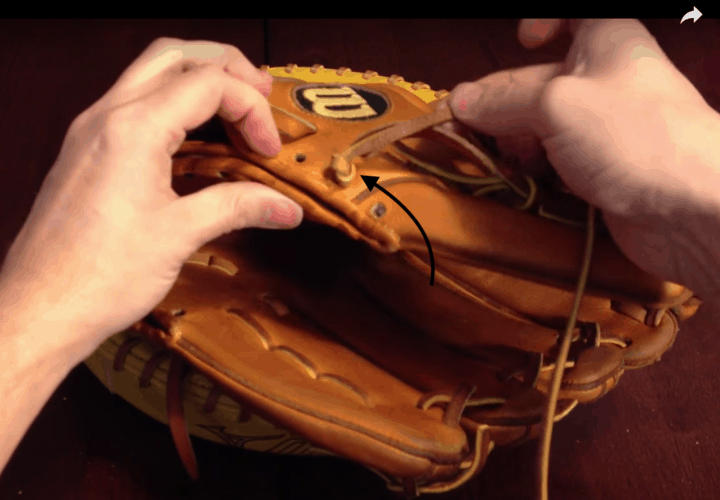 Lacing baseball gloves may seem like a daunting task, but with a little bit of patience, it can be a rewarding weekend project. For a great video to watch with instruction, check out out this video.